Shielded cord set comprising Supra LoRad 3 x 2.5 mm2 cable, Supra SWF10 female connector (IEC-320) and Supra SW-EU straight male plug. Current rating is 10 ampere continuously. 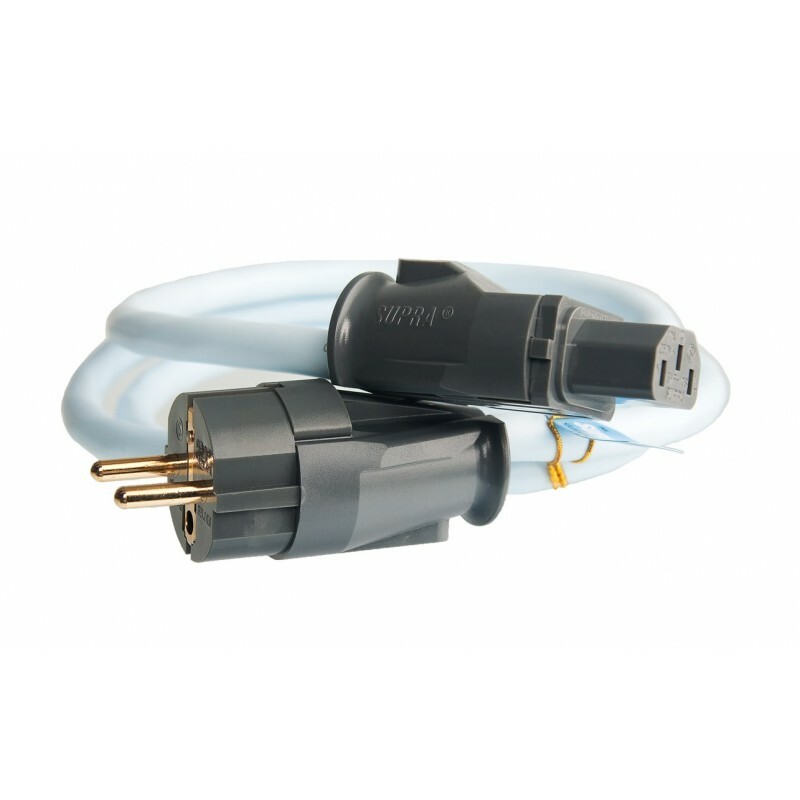 The EU-version with Schuko plug, is the most common standard throughout Europe. Exceptions are Denmark, Italy, Switzerland, Ireland and Britain. Fits our LoRad mains power distribution blocks rated 10 ampere. LoRad means Low Radiation and the design of these mains flex cables minimises both electric and magnetic alternating fields. Allow your hi-fi gear the most welcome benefit of all, the possibility to be silent when supposed to. Only then, the tiniest details and notes will become clearly audible and the background of time delayed reflections, real or artificial, that represent the acoustic invironment in the recording will display the entire sound stage to the conscious hi-fi enthusiast. Or, when translated to the world of home cinema, only the movie shows, not the artefacts, nor the noise deriving from the huge variety of electrical device interferences present in most modern households. LoRad protects both from alternating fields radiating from the cable as well as from pick-up of surrounding airborne noise fields, e.g. wireless and mobile phones, wifi, radio and TV broadcasts, etc. LoRad MkII is a development of the LoRad concept, now with improved shielding, flexibility, bend-/fatigue-resistance and strength. In addition to the physical shield incorporated in the cable design, the leads are spun in a short pitch, counteracting the magnetic alternating field that according to the physical law of inductance always surrounds a lead that carries a current. Also the pick-up of inbound unwanted fields will be lowered by this measure. The benefits are less noise picked up by the cable, less noise caused by the cable inside and less noise that infect adjacent cables such as low level interconnects. You will notice cleaner sound, pronounced transients, richer fine details, a silent background and an improved 3D soundstage. 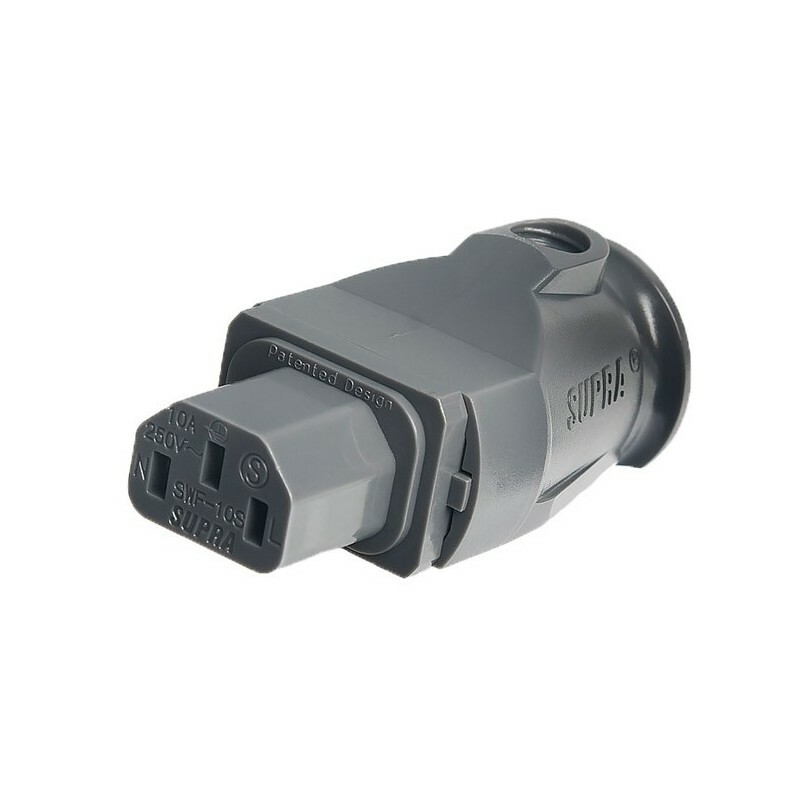 If your equipment is installed using Supra cables, is connected with the mains power cables in phase, the noise floor is normally suppressed by several dB, allowing a lot more of the content to be revealed. This off course is even more articulated for enthusiasts playing high resolution media, where the large amount of extra quality in details often at the price of four times the data amount, in the end hardly matters if all of this extra get lost on its way to the ears or eyes. Low radiating cables is also increasingly important from a health point of view. Science has proven that alternating magnetic fields affects cell growth. LoRad MkII now incorporates Supra's unique Carbon/Nylon shield concept. Semiconducting Carbon/Nylon shield displays improved properties, bending strength, environmental immunity, higher tensile strength and less microphonic effect. The Carbon/Nylon shield is connected to a drain-wire along its total length, efficiently leading noise stuck in the shield to ground. We have tested and evaluated all known types of screens for making such a good cable as possible. Supra’s semi-conductive Carbon/Nylon shield was the only that passed the rigorous safety requirements and, moreover, its shielding properties was the best ever. LoRad MkII is tested and certified by Intertek Sweden, meeting the European safety regulation HD21.5 S3. The cable must be connected to a wall socket with a ground terminal for the full LoRad effect to take place.